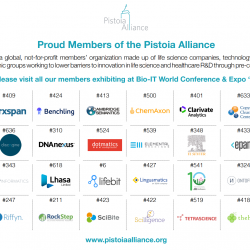 Pistoia Alliance Webinar: Blockchain, IoT and the GxP Lab – technology helping compliance? Abstract: Good Clinical, Manufacturing and Laboratory Practice, or GxP sits at the heart of a trusted and trustworthy pharmaceutical industry. Although highly regulated and validated, and so somewhat change-resistant, GxP facilities still actively look out for new technologies which can make their staff, processes and products more secure, safe and effective. Two high-profile new technologies have the potential to positively impact the GxP domain significantly: Blockchain (or Distributed Ledger Technology – DLT) and The Internet of Things (or IoT). As a continuing part of the Pistoia Alliance’s drive to improve education and communication around new technologies to life science professionals, this webinar will explore how blockchain/DLT and IoT could come together to add even more trust to the GxP domain. If you want to know more about how these new technologies could help enhance GxP compliance, then this webinar will give you much food for thought.